Virginia Mae (Jensen) Schnack (February 9, 2018) | Burmeister-Johannsen Funeral Home, Inc.
Family will greet friends from 5:00 – 8:00 PM at Immanuel Lutheran Church. Virginia Mae (Jensen) Schnack, the daughter of Raymond Gerald and Hilda (Christiansen) Anthony, was born on November 12, 1933, in Harlan, Iowa. She attended Irwin, Iowa, schools before marrying Louis Eugene Jensen, Jr. on May 22, 1950, in Maryville, Missouri. She and Louis made their home in Harlan where they owned and operated the Brickyard Orchard. In 1968, Virginia began working as a bookkeeper at Jim Goeser Wholesale Meats in Harlan. In 1985, she moved to Phoenix, Arizona, where she was employed at City Meats. She later returned to Harlan to care for her mother. Virginia returned to her position at Jim’s Meats, continuing there until her retirement in 1991. In recent years, she had worked at Pamida, as well as the Harlan Flower Barn. On June 13, 2015, Virginia married Gail Earle Schnack in Harlan, Iowa. Virginia was a member of the First United Methodist Church in Harlan, Iowa, and she had most recently worshipped with her husband, Gail, at Immanuel Lutheran Church in Harlan. An avid golfer, she was a member of the Harlan Golf and Country Club. Virginia was also a member of the Zenobie Rebekah Lodge #286, and was formerly active in the Harlan Band Parents Booster organization for years. As co-owner of the Brickyard Orchard, she made many apple pies; her family and friends called her a pie baker “extraordianaire”! 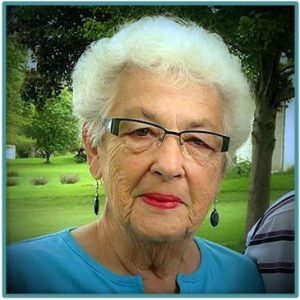 Virginia M. Schnack died on Friday, February 9, 2018, at Myrtue Medical Center in Harlan, Iowa. She had reached the age of 84 years, 2 months, and 28 days. Virginia was preceded in death by her parents; her first husband, Louis Eugene Jensen, Jr., on November 18, 2013; one sister, Barbara Horney; and one granddaughter, Angie Wohlhutter. She is survived by her husband, Gail Schnack of Harlan, Iowa; four children, Linda (Rod) Terry of Corvallis, Oregon, Pat (Mike) Wohlhutter of Harlan, Iowa, Gail (Joe) Gross of Earling, Iowa, and Rodney (Kelli) Jensen of Audubon, Iowa; three step-children, Kathleen Stanton of Des Moines, Iowa, and Dr. Sherrie Schnack and David Schnack, both of Minneapolis, Minnesota; 11 grandchildren; five step-grandchildren; 18 great-grandchildren; three great-great-grandchildren; and other relatives and friends. A Celebration of Life service was held on Wednesday, February 21, 2018, at Immanuel Lutheran Church, Harlan, Iowa, with Pastor Phil Nielsen officiating. Marge Ahrenholtz and Chrissy Jensen served as musicians. Burial of ashes was in the Harlan Cemetery, Harlan, Iowa. The Burmeister-Johannsen Funeral Home in Harlan, Iowa, was in charge of the arrangements. Condolences may be left online at www.burmeisterjohannsen.com. So sorry to hear of your mother’s passing. I remember her well as a good friend of my in-laws, Clare and Rita Lyon. She was a lovely lady. Very sorry . Please accept our condolences to all concerned. We are so sorry to hear of your loss. Don enjoyed working with Virginia for years at Jim’s Wholesale Meats. She will be missed by all who knew her. Sorry to hear of Virginia passing. My prayers and thoughts are with you and the family.